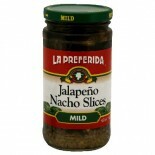 Attributes: Natural or Organic Ingredients, Specialty ProductIngredients: Jalapeno peppers, water, carrot,onion, vinegar, iodized salt andf spices.Nutritions: Calcium(0), Calories(5), Cholesterol(0), Dietaryfiber(0), Fromfat(0), Iron(0), Protein(0), Saturatedfat(0), Servingscontainer(6), Servingsize.. 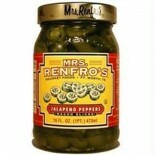 Attributes: Natural or Organic Ingredients, Specialty ProductIngredients: Jalapeno peppers, water, carrot, onion, vinegar, iodized salt and spices.Nutritions: Calcium(0), Calories(10), Cholesterol(0), Dietaryfiber(.. 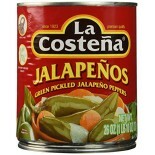 Attributes: Natural or Organic Ingredients, Specialty ProductIngredients: Jalapeno peppers, water, carrot, onion, vinegar, iodized salt and spices.Nutritions: Calcium(0), Calories(5), Cholesterol(0), Dietaryfiber(1), Fromfat(0), Iron(0), Protein(0), Saturatedfat(0), Servingscontainer(23), Servingsiz.. 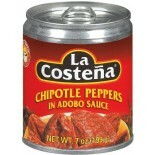 Attributes: Natural or Organic Ingredients, Specialty ProductIngredients: chipotle peppers, vinegar, tomatoes, onions, sugar, iodized salt, paprika, soybean oil and spices.Nutritions: Calcium(0), Calories(20), Cholesterol(0), Dietaryfiber(3), Fromfat(5), Iron(0), Protein(1), Saturatedfat(0), Serving.. 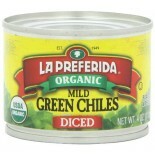 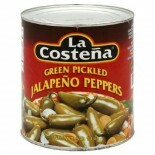 Attributes: Natural or Organic IngredientsIngredients: organic diced green chiles,natural untreated salt, citric acid .. 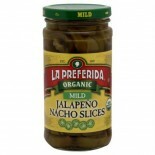 Attributes: Dairy Free, Gluten Free, Kosher, Natural or Organic Ingredients, Specialty Product, Vegan, Wheat Free, Yeast FreeIngredients: organic jalapeno peppers,water,organic vinegar,sea salt. 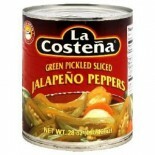 Ingredients are grown without the use of synthetic pesticides or herbicides. 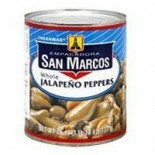 No artificial colors, flavor.. 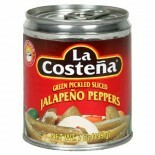 Attributes: Dairy Free, Gluten Free, Kosher, Natural or Organic Ingredients, Specialty Product, Vegan, Wheat Free, Yeast Free..